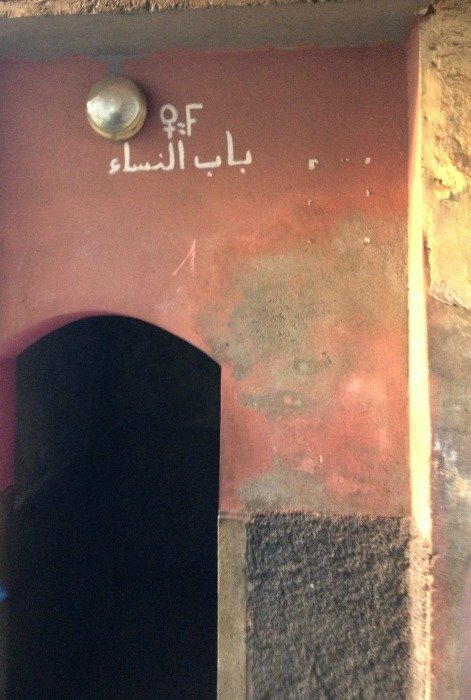 Maybe you’ve heard of it, and maybe you’re wondering what is a hammam? 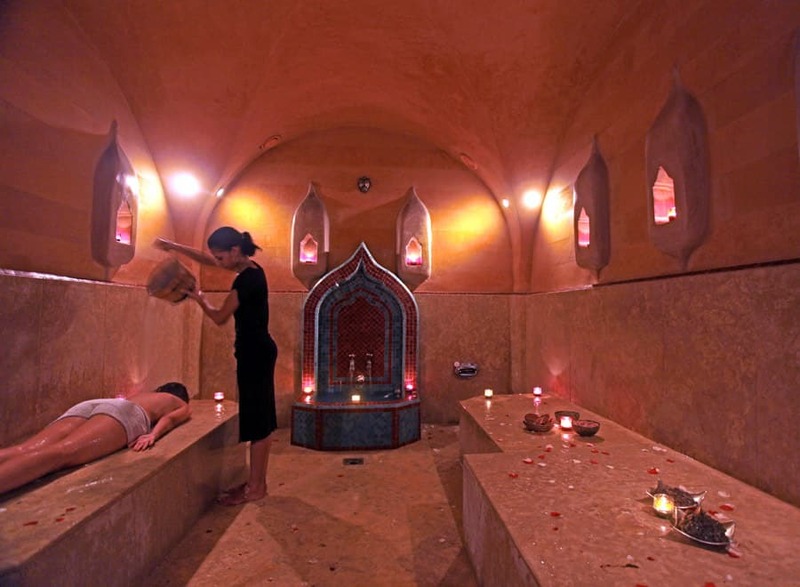 The Moroccan hammam is one of the most widely loved and yet puzzling experiences for people who have never visited or Morocco nor had the opportunity to try a hammam. 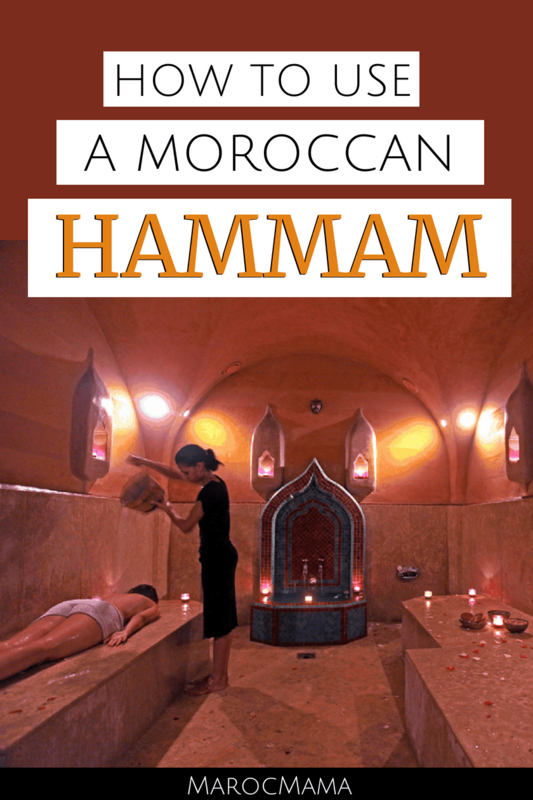 Many “must do in Morocco” lists include take a hammam but just what does that mean and why is it such a revered tradition? It’s hard to imagine but not so long ago it was very uncommon for people to have their own shower or bath in their homes. I can remember my grandparents telling stories about taking a bath in a metal tub once a week. Water, and especially hot water was a precious commodity before the era of hot water heaters. In Morocco a practical solution was created to get around this difficulty. The hammam. Today you’ll find a wide range of hammams in Moroccan cities. The most traditional variety are found in neighborhoods everywhere. You also will find luxury hammams in major cities. A third variety are a step up from traditional hammams but more affordable than luxury style. Depending on which you will visit, your experience will vary. If you opt for a more upscale hammam your experience will be similar to that of a spa. While each is slightly different you’ll be asked to undress (leave on your underwear), and given a robe. You’ll be escorted to a warm/hot room and asked to sit and relax. Next, savon beldi is used and rubbed all over then rinsed off. Using a kess, an exfoliated hand mit, a woman will scrub your entire body. Yes, it may feel rough but this is what removes the dead skin. If it’s too hard, let her know! Bshwiya means slow down or soften up. You may be asked to turn over, move around or lay down. Once she’s satisfied then she’ll either continue bathing you by washing off with your soap, and shampooing and rinsing your hair as well or she’ll leave you to do this alone. The entire process takes 30-45 minutes. Going to a neighborhood hammam is a completely different experience. One of the biggest differences is that the screen of privacy is removed. A local hammam reminds me of a three part locker room shower house. On entering you will pay someone, usually a woman at the entrance. If you want to bathe yourself it’s 10-20 dirham (depending on the hammam), if you want to be scrubbed it’s about 50 dirham. The next room you enter has long benches. This is where you change your clothing. What do you wear in a hammam? Nothing, or at least very little. Take off everything, except your underwear, wrap up in your towel and wear your flip flops. You’ll then give your bag of clothing to another woman who monitors the cubbies of belongings. Take with you the items you need for bathing (soap/shampoo etc). You’ll then be greeted by the woman who does the scrubbing. For someone who has never been to a hammam it may be a shock to discover not only will your attendant will also likely be naked aside from underwear, the hammam is full of other women of all ages in a similar state. Most people are caught off guard as they assume the conservatively dressed women outside would be more guarded. Not so. Your attendant will bring you into the bathing area and set aside your towel. Once inside you’ll notice three different rooms. They start with a warm room, than a warmer room and finally the hottest room. Let her lead the way! Find a spot and get yourself set up. She’ll use your water bucket and possibly others that are there to use. You’ll want to remember only to use your water buckets. They’re filled by spigots in each room and that can mean a wait at times if the hammam is busy. Don’t steal someone else’s bucket! After rinsing off you start by using savon beldi and rubbing it all over. Leave it on for 5-10 minutes, sit back and relax. Moroccan women go to the hammam as much for a bath as they do to catch up on gossip! When it’s time your lady will come back and rinse you off. She’ll ask for your kess and will start scrubbing. This isn’t a delicate procedure! Remember bshwiya means go softer. You may feel like a toddler again being flipped over and handled while she ensures you’re cleaned top to bottom. When she’s satisfied she’ll start rinsing away all the skin that’s been removed. Then you’re on your own to soap up and rinse off, wash your hair, shave your legs whatever it is you typically do in the bath. She’ll continue to bring you water to use as needed. When you’re done, gather up everything and make your way back to the changing room to get dressed. Voila! Expect to spend at least 45 minutes at the hammam but take your time. Many Moroccan women spend several hours! Hammams in Morocco are very unique and can be a wonderful way of experiencing local culture. Leave your modesty at the door and let the experience speak for itself. Trust me, you’ve never felt as clean as you will after a hammam! I have been in the hammam many times when women put the henna in their hair. Being a blonde, I did not experience it myself, but most of the older women did it to cover their gray hairs! Hi – thanks so much for the article. Do you have any recommendations for introducing kids to a hammam? I’ll be traveling there in a few weeks with my three kids, ages 4, 6, and 9. My oldest is a boy and the other two are girls. We’ll be in both Fez and Marrakech. Thanks!!! You’d need to find a private hammam as most don’t allow gender mixing at that age. I would check with your riad/hotel first as that will be easiest with the process! 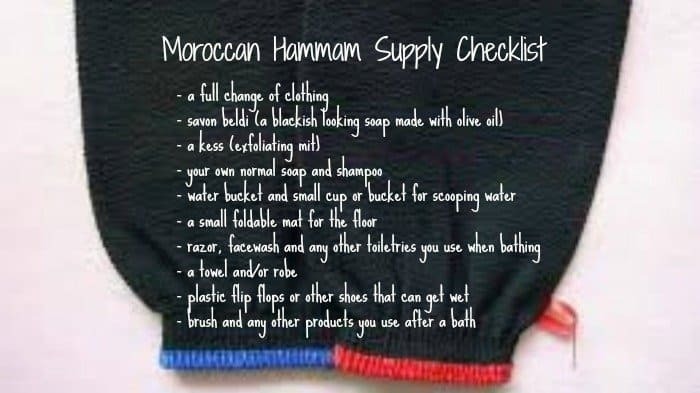 One quick question: if I want to visit a local hammam, what’s the best way for me (as a tourist) to get all of the items I need? But, again, thanks for sharing this article – your entire blog has answered pretty much all of my questions about Morocco so far, and I’m SO EXCITED to go! Hi – local hammams will be quite the shock unless you speak Arabic (some ladies working there may speak French). The best way I think to navigate this is to ask at your riad for help. They can help you gather the things you’ll need to take with you and even go with you to buy the ticket and explain what you want. What a great article. I’ve been to a hammam in one of the hotels I stayed in, you did a great job of describing the experience. I want to also comment on your article of 10 things women should know while visiting Morocco. Good article. I am also married to a Moroccan , I love Morocco and its people, in general they are very welcoming and want you as a tourist to have the best experience. I visited Morocco last year and had a wonderful time! Can you recommend a source for a type of savon beldi that would be used in Fez? Some people claimed the Fez type was better or gentler than the Marrakech type. No hard feelings. The actual soap is the same thing – in Fes they don’t scrub as much and they use akar al fassi. Also sometimes ghassoul clay is used instead of savon beldi. The clay is better on my sensitive skin. A bigger factor is how hard the scrub is. In Fez it seems much lighter than in Marrakech. Hi I really liked your post. I’m going to Marrakech in October. I would love to try a local hammam that offers the scrub and massage. I am travelling with a friend and 4 children. The oldest 2 are 14 one is 12 and one is 10 is there a hammam you can recommend for a family. Hi, That’s a tough question. Any neighborhood hammam is an option. But massage typically isn’t part of the package. They’ll do the scrub but I’ve never been to one that has massage. For that you’d want to book in a spa. Hammams are separated by gender so there’s that issue too (not sure the breakdown!) Also how comfortable they are being more or less completely naked in front of a room of strangers. I’m sure something might exist but I’m afraid I’m not confident in where to recommend to give a suggestion. Thank you so much for this post! I’ll be going to Marrakech in Dec to meet my BF’s family and I’ve been a little scared of this experience because I know nothing of it. Getting the basics of what will happen is very reassuring. What a wonderful post! Thank you for bringing back this experience for me! I, too, have a lovely Moroccan husband, although I have not had the chance to live in Morocco as you do. On both of my trips there, however, I went to the local hammam with my mother-in-law and sometimes with my pre-teen sister-in-law. The first time I was pretty taken aback with all the scrubbing going on. I have sensitive skin, but thankfully my mother-in-law was there to be my guide and she understood immediately so I was able to gently soap-up as I wanted to. I did scrub her down, however, and it was a great bonding experience! I think that is what the Hammam boils down to- a bonding experience between women. There is no class distinction when you are all in your undies and you can just be yourself and let it all go (including your dead skin)! I was fascinated by the henna that some women were putting on themselves and in their hair. If I were not quite so pale I might try it… although I think I might end up looking like a burnt piece of clay rather than a nicely tanned young lady. Have you ever seen people putting henna on in the Hammam? I hope to be able to go back to Morocco soon and make that special bond with all the aunties and family and friends again!